It's already the 5th month of the year and Summer is in full swing this year in India. just after winter, a sudden hot weather has baffled us all in eastern part of India. But cursing the Sun is not the solution at all that I know, better take care of ourselves is the solution. In this hot summer, we all loose our appetite and what we crave for is cold drinks, fruits, desserts, ice-creams etc. It's very important to hydrate our body in summer than eating food. In summer, we should eat more fruits and vegetables than non-veg. food like meat and eggs. Summer vegetables, like all kinds of gourds especially Bottle gourd has amazing cooling properties, which cools your body from inside. 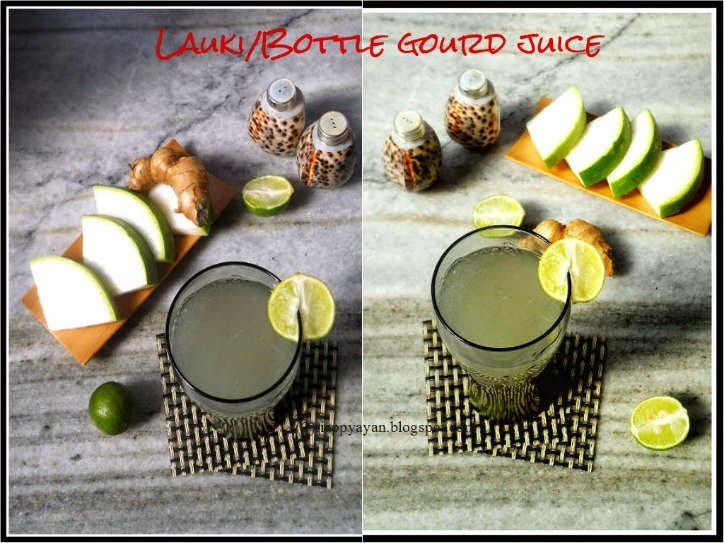 Bottle gourds are known in many names in India, such as lauki, dudhi, lau(in bengali) etc. Ayurveda have praised bottle gourds for nutrient rich contents and their magical effects in various health ailments like high blood pressure, cholesterol, diebetes, overweight and digestive problems. Nutrition facts of Bottle Gourd : It has 96% of water content, so it's very easy extracting juice from bottle gourd. It is enriched with dietery fiber, Vitamions B and C, Minerals like sodium, potassium, iron etc. It's very low in fat and cholesterol and with so many health benefits, it's a perefct vegetable if you want to loose weight. Remember : A case of "bottle Gourd Poisoning" came into notice few years ago. Since then a publice advisory has been issued which says," A slice of bottle gours should be tasted before extracting the juice to ensute that it is not bitter, if bitter, it should be discarded and not be consumed. Note : Do not mix bottle gourd juice with any other vegetable juice. Regular comsumption of 1 cup bottle gourd juice with a glass of water in empty stomach in early morning helps to reduce high blood pressure and cholesterol levels which makes your heart healthy. The cooked vegetable is cooling, diuretic, sedative and anti­bilious. It gives a feeling of relaxation after eating it. The bottle gourd juice is helpful for urinary disorder. 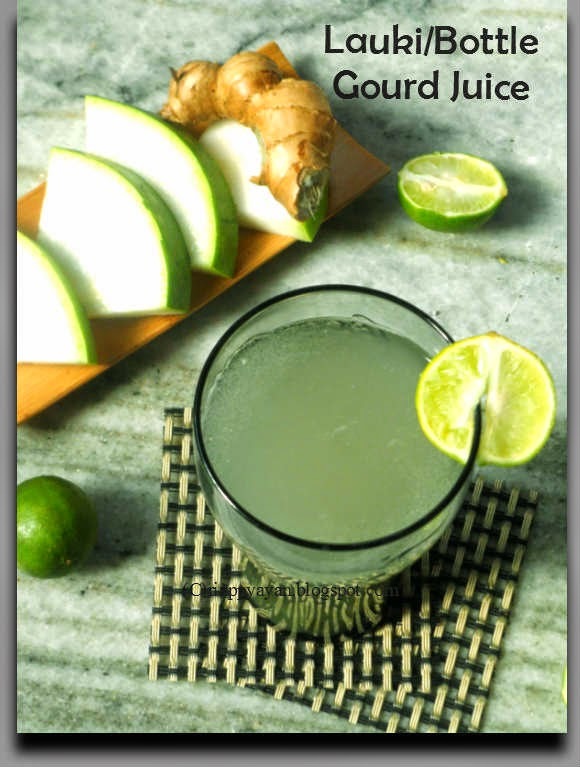 A glassful of fresh juice prepared by grating the whole fruit should be mixed with teaspoonful of lime juice. It should be given once daily in the treatment of burning sensation in urinary passage due to high acidity of urine. It serves as an alkaline mixture. The juice of bottle gourd is a valuable medicine for excessive thirst due to severe diarrhoea, diabetes and excessive use of fatty or fried foods. A glassful of plain juice with a pinch of salt should be taken everyday in this condition. Its use during summer prevents excessive loss of sodium, quenches thirst and helps in preventing fatigue. The Gourd fruit juice is used in the treatment of insanity, epilepsy and other nervous diseases. The juice of the fruit is used in the treatment of stomach acidity, indigestion and ulcers. Bottle Gourd helps in constipation. Bottle gourd is not only rich in essential minerals, iron, protein and trace elements; it is also rich in fibre. Fibre is known to be missing in the modern diet, the absence of which is the cause of not only constipation but other digestive disorders like flatulence and even piles. Hence diet using different preparations made from this vegetable are useful. Lemon juice : 1 tblsp. Black salt : 1/2 tsp. Take all the ingredients in a blender except black salt and ice cubes and adding enough water blend them for 2 minutes. Let it sit for 2-3 minutes in the blender, so the pulp will go down and it will help in strain the juice. Serve in individual glasses with black salt and ice cubes added. 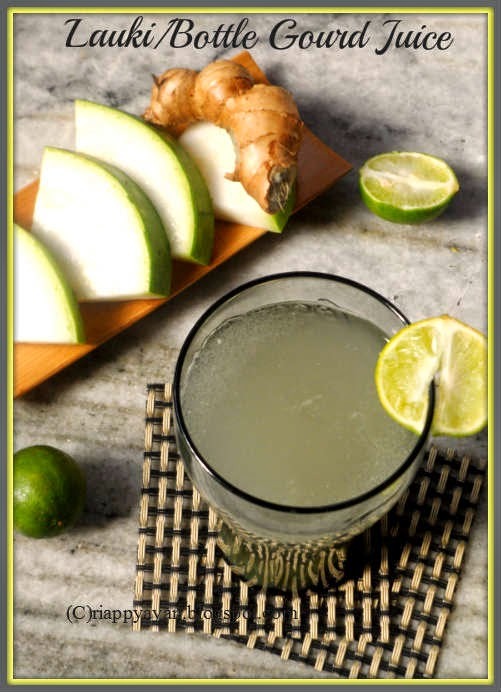 So, include this awesome health drink from tomorrow for yourself and for your loved ones, especially if they are suffering from High blood pressure, Cholesterol, constipation and stay healthy and cool in this summer. It does take 10 minutes of your time but gives you immense benefits. 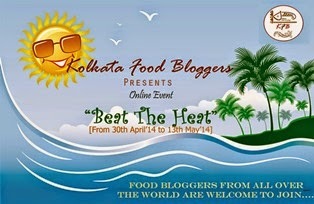 I'm sending this summer cooler to Kolkata Food Blogger's online event, "Beat the heat" .